Every so often I have to go through my closet and clean out the old stuff (you know, to make room for the new stuff!). But the question remains – what do you do with worn-out or barely worn items of clothing that you no longer wear? I’ve found a few good (and very green) answers for what to do with your worn-out wardrobe; upcycle those clothes into something new, or donate them to help others in need. Remaking an old item into something new can be a fun challenge. It is really satisfying to remake an item and wear it, and to get lots of compliments on your “new” wardrobe item. And remember, you can also remake clothing into something new as a gift, too! Here are some of my favorite ways to “made do” and make new with old clothes. Turn and old, oversized tee into a pretty pleated blouse with this tutorial from Dorian at Busily Spinning Momma. 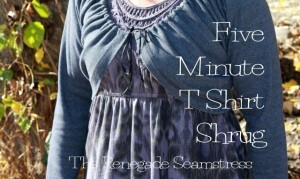 Start with a long sleeved t-shirt and follow these directions for making a stylish Five Minute T Shirt Shrug from The Renegade Seamstress. Believe it or not, t-shirts make excellent aprons! They are absorbent, colorful, and wash-up well. 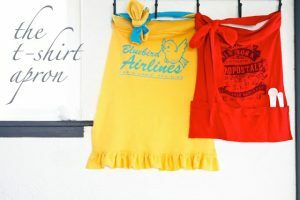 Make your very own recycled Easy T-Shirt Apron with this tutorial from Ruffles And Stuff. And yes, take it from me, t-shirts can also make very handy recycled shopping bags. (And these make great gifts!) 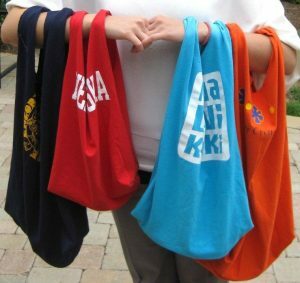 Make a Fast Recycled T-Shirt Tote Bag with directions from SewMargaretSew at Instructables. For even MORE t-shirt recycling ideas, visit the awesome TrashN2Tees big board of ideas and tutorials at Pinterest! Go from a men’s shirt to a women’s blouse with the “He can’t have it back now” tutorial from Little Blue Mouse. This is an adorable idea – a convertible skirt! Buttoned up to be short, unbuttoned to be long. Make one from a few old men’s shirts with Carly’s DIY: 3 Men’s Shirts to Convertible Skirt tutorial. 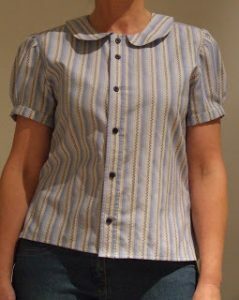 Philippa shares a great idea to cut a smaller summer shirt pattern out of a larger men’s shirt. Also a wonderful idea for making kid’s clothes from men’s shirts. 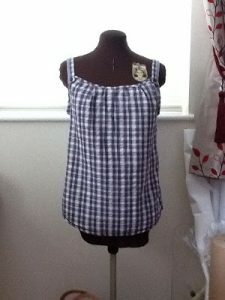 Use your favorite pattern and see how it’s done with the Men’s Shirt Refashion to Cute Summer Top post at Gloria & Me. Wear this apron to give you full protection while gardening, crafting, cooking, cleaning, or even tuning up your vintage car! 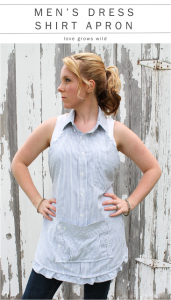 Get the Men’s Dress Shirt Apron tutorial from Liz at Love Grows Wild. And hey, this is also a great gift idea! 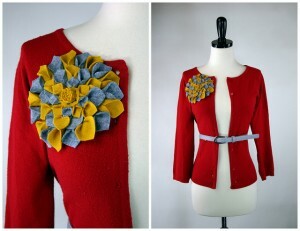 Most often all a plain old sweater needs is a little embellishment to bring it back to life. Get not just this one added embellishment idea, but 30 ideas from Grosgrain’s 30 Days of Embellished Knit posts. Start with an old sweater and end up with this warm and cozy cowl! 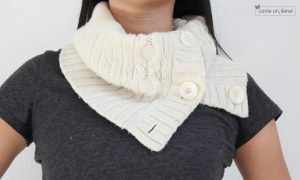 Ilene shows you how at her Upcycled: Cowl Scarf from Old Sweater tutorial. Know anyone that would love to get a warm and cozy cowl as a gift this winter season? 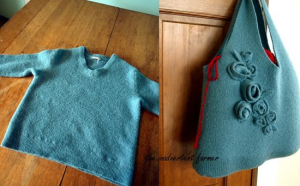 The Inadvertent Farmer takes an old sweater, felts it up, and turns it into a lovely bag. See how it’s done at the Alpaca Wool Sweater into Felted Handmade Bag tutorial. 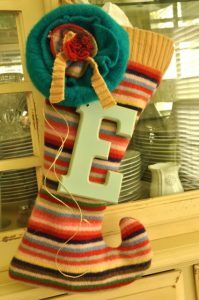 It can’t get any more adorable than these recycled sweater stockings! The more colorful the sweater, the brighter the stocking. Find out how to make your own from the How to Turn a Sweater into a Stocking tutorial at Blissfully Domestic. 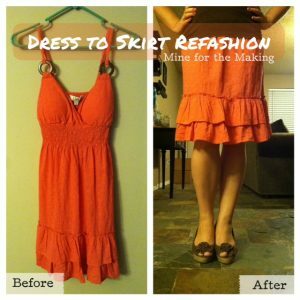 Turning an old dress into a skirt is a time-tested, age-old idea that is still completely fabulous. 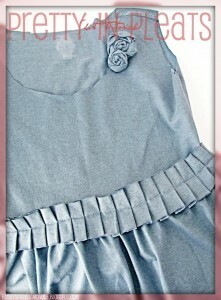 See how easy it can be with the Dress to Skirt Refashion tutorial. Sometimes just a few changes can update the look of a dress and make a world of difference. 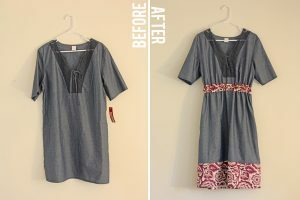 See Kate Sew shares her frumpy dumpy dress refashion. Print your pants! BurdaStyle shows you how. 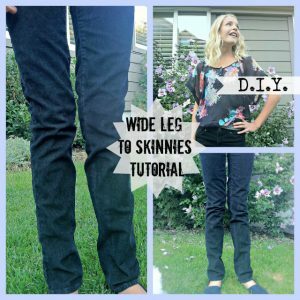 Take those W I D E legged pants or jeans and turn them into skinny pants with this tutorial from Eat Cake. If you have items of clothing that you just can’t do a thing with, consider donating them to help someone in need. Here are some places that accept used clothing donations. Click on the name of the organization or program to learn more and find a donation center near you. Previous Previous post: WeAllSew Celebrates Our Loyal Fans: 63,000 Likes!